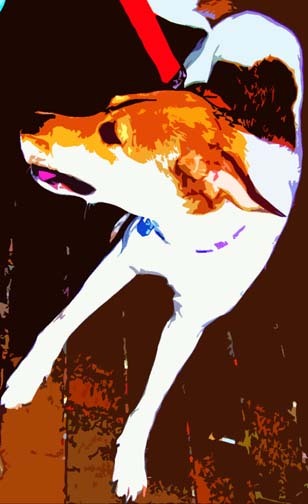 BZTAT and Pawcurious team up for a 24-hr Blog and Paint-a-thon! Artists don’t make a lot of money, but we have our causes that we want to help just like anyone else. So when we can’t donate money, we share our art. I get asked to donate to a lot of causes, and truthfully, I am starting to say “no” with only a few exceptions. You can read why here. Pet charities and Be the Change for Pets is my main exception. I have done 12 hr. paint-a-thons in the past where I painted for 12 hrs. and auctioned off the resulting art to benefit pet rescue. When Dr. V. of Pawcurious said at BlogPaws West she was going to do a 24-hr Blog-a-thon for a pet cause, I got caught up in the moment. Mark your calendars. the Paint-a-thon begins on Saturday, November 13th, starting at 2pm EST. There will be more details coming, including how this will correspond with Dr. V’s Blog-a-thon and about other bloggers who will be joining in for the cause. Details about which charities will benefit from the auction sale of the artwork and how it will be auctioned will also be forthcoming. This will be the last paint-a-thon that I do for while, as I need to focus on earning a living from my art. My critters and I have our own needs. So if you are looking for an opportunity to get a great piece of art and benefit animals in need at the same time, you will want to tune in. The love of a pet never grows old, and there are so many out there just looking for someone with whom to share their love. What can you do to “be the change” for them today? Please feel free to share and use the video above for whatever cause you want to highlight to benefit animals in need. Art of Kindness: Yep. I am doing another Paint-a-thon. This time last year, I held my first 12 hr. “Paint-a-thon” as a part of the Art of Kindness fundraiser for Friends of Stark Pound. It was a huge success! The overall event raised over $2500, of which $520 was raised from the sale of my paintings created during the Paint-a-thon. All of the paintings were purchased from bids taken on Twitter. Rumor has it that this may have been the first online auction done on Twitter, although I cannot confirm that. I have done 2 other paint-a-thons since then, both of which were very successful and a lot of fun. And guess what? We are doing another one for this year’s Art of Kindness event! All Proceeds from this Paint-athon will go to support the animals with Friends of Stark Pound. On Thursday, September 23, 2010, I will engage in an exclusive “Paint-A-Thon”, painting animal themed artworks non-stop from 9:00 am to 9:00 pm at Second April Galerie at 324 Cleveland Ave. NW in Canton, OH. All works created in that 12 hours will be auctioned off in a silent auction at Second April and online via Twitter. Online bidding on BZTAT artworks will begin at 7:00 pm EDT and conclude around 9:00 pm EDT. My paint-a-thons are a great way to find some affordable bargains on artwork that my never come around again. You can bid on the artwork either on site at Second April Galerie or online via Twitter. 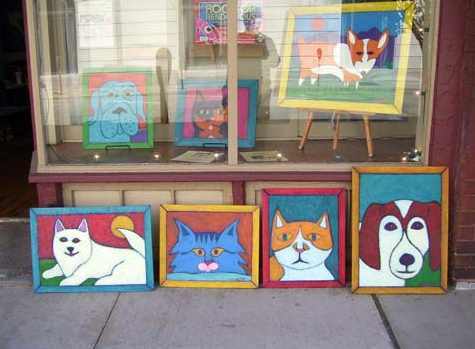 The Paint-A-Thon is in conjunction with a fund raising and animal adoption event entitled the Art of Kindness. 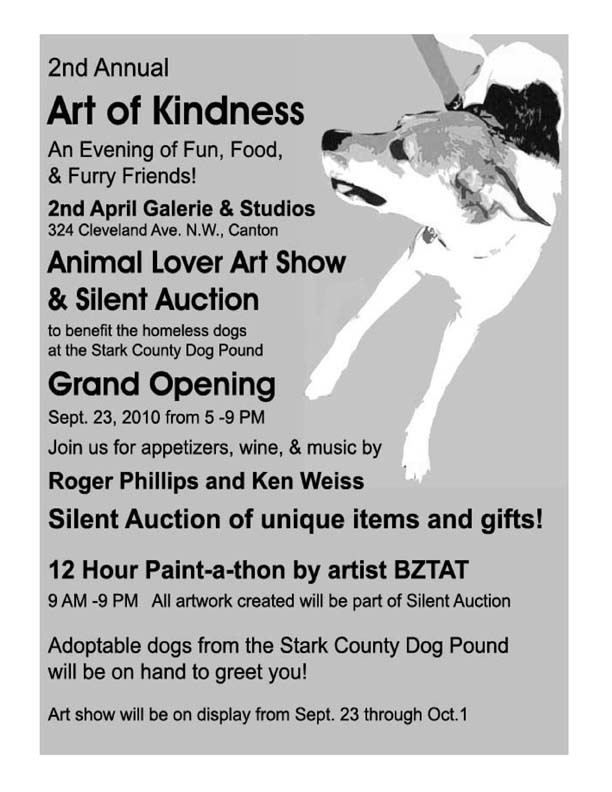 Billed as “An Evening of Fun, Food and Furry Friends!”, the Art of Kindness will include an animal themed art exhibit showcasing local talent; a silent auction of pet-related items; music by Roger Phillips and Ken Weiss; food and drink; and lots of furry frivolity. Pets available for adoption will be on hand to greet those who attend. Several artists from the Stark County area have contributed animal-themed artworks to be shown in a very special art exhibit. The showing is curated by Brennis Booth, co-owner of Second April Galerie. Friends of the Pound is an all-volunteer 501(c)(3) non-profit organization established to coordinate community outreach, rescuing and fund-raising efforts for the puppies and dogs being held in the Stark County Dog Pound. Friends of the Pound operates in cooperation with the Stark County Dog Warden’s staff to significantly enhance the quality of life for the homeless puppies and dogs and to increase their opportunities for placement through adoptions or rescue groups. I will have assistants tweeting photos of the works on Twitter as I am creating them and after they are completed. If you would like to submit a bid on Twitter, please send a tweet with the word BID in all caps, your bid amount and #bztatptg written in the tweet. Your profile must be visible in Tweetgrid for us to receive the bid. All bids must be in $5.00 increments. The lowest bid for all works will be $40. Bid winners will receive instructions to pay the winning bid via PayPal plus $20 US shipping or $40 international shipping per painting. A 10-minute warning will be tweeted to announce the conclusion of the auction 10 minutes before bidding stops. Follow the #bztatptg hashtag on Twitter to follow all the action. You do not have to bid to join in the fun! I hope you will join me for this special event. I promise to have some new and fresh images that have not been seen before. Have suggestions for what you’d like me to paint? Leave them in the comments below. There are so many “psychiatrists” in waiting, hoping to get the chance to heal your soul. Would you consider letting them do their job? I support Friends of Stark Pound in Stark County, OH, who has many dogs waiting for homes. There are many more rescue organizations across the world doing good work to help animals in need. We can all “Be the Change” for animals in need simply by supporting and helping their efforts. What will you do to “Be the Change” today?